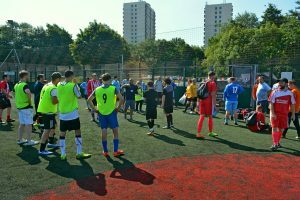 June was another busy month here at Liverpool Homeless Football Club. We were busy agreeing the finer details for our Women Against Domestic Abuse 2018 Tournament #WADA18. There was great interest in teams registering to take part and offering their support for the day. According to national statistics domestic abuse disproportionately affects women, at the hands of men. In addition to the obvious human rights and health repercussions of domestic abuse, violence at home has economic implications. A woman may experience violence because she lives in poverty, but she may also experience poverty as a result. Two women are killed by their partner every week in England and Wales. Of all female homicides, 40% are killed by gendered violence. The UK police receive a call every minute about domestic abuse, 89% of which are about a woman being abused by a man. There have been links made to football and for several years, British organisations have recorded a rise in reports of domestic violence after England’s World Cup matches. So the timing of this year’s WADA tournament is perfect. It is vital that we raise awareness, try to make a difference and stand together to offer our support to those who need a helping hand or a listening ear. 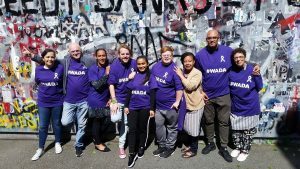 Thank you to everyone who took part in our purple ribbon Campaign on social media all the #WADA18 t-shirt pics were fabulous, you are all on our Facebook, Instagram or Twitter and we really do appreciate your support. 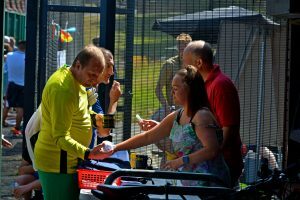 We were thrilled to be working with Worst Kept Secret again and both South and North Liverpool Domestic Abuse Services you have all been very kind, I really do appreciate all the helpful information you have given me whilst organising the tournament. Stephen Barton your boots are harder to fill than I first thought but you will be happy to know I finally do know how to take scores and almost know how to do the fixtures. LHFC Ladies team are loving The Futsal league and compete every Thursday evening at Anfield Sports & Community Centre. We are always looking to welcome new players. If you or anyone you know would like to join in please contact myself or Jess Lomax our Team coach. 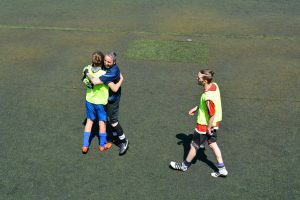 The league is a great way for women to play who don’t want to compete in traditional 11 a side or 5 a side football, its ideal for beginners but is competitive and welcomes women of all abilities. If you are interested in joining then get in touch via our contacts page . 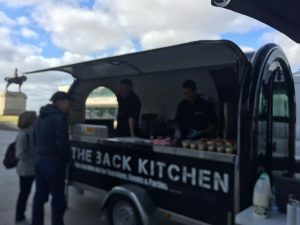 Friday 22nd June we had The Back Kitchen out again supporting The Whitechapel centre’s Big Boss Brekkie Week 2018. LHFC volunteers and our CEO John Finnigan arrived on the Strand at 7am and parked up at the Pier Head. 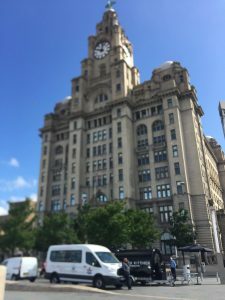 The idea is for the people of Merseyside to get together to enjoy a Big Boss Brekkie to raise funds to support homeless people. So our Back Ktichen catering team were on had to cook and serve some delicious breakfast rolls and some healthier options of fruit topped yoghurt muesli pots. Thank you to everyone who supported us and Liverpool City Council for continuing to support homeless people in our great city. Initiatives like this just highlight the fact that we all need to work together in partnership to make a difference. This month’s tournament was to raise awareness to addictions. Thanks to Addaction for providing a wealth of information for additional support. The team engaged with players and support workers and gave out some great free gifts. We had another fantastic turnout in spite of the scorching temperatures and all teams played on in great spirits. I would like to welcome our latest team Rojava who were last minute entrants into the league. It was lovely to meet you all, good luck in the next games, you played well and some great goals were scored. I’m glad you all settled in very quickly and made some new friends. After a slow start, [apologies for the fixture mix up] The County FA Refs, myself and Marseille managed to get all teams ready for kick off . You all done brilliantly with a few spectacular goals Micks hat trick was fantastic and definitely deserves man of the match for effort. Ricky saved some great goals too. It was also great to see the teams playing very competitively and professionally, with respect for each other. The team spirit was spilling over into friendships. Not forgetting the friendly banter amongst teams, resulting in such a great day. I have included the scores below, but all results and tables will be on The County FA Website. As usual, the day would not be possible without our dedicated team of staff, volunteers and partners. Many thanks to everyone who supported us. There are too many to mention but you know who you are. You are all amazing and always work hard to make our events a great success. We hope you are all looking forward to Match Day 5 on July 31st 2018. We look forward to seeing you all when we will be highlighting the support services for Disabilities and our very own V.I.P LHFC Ambassador comdeian Mr Gary Skyner will be joining us.